This paper sought to answer the question why Russian marriage alliances were still made with Catholic rulers even after changing to Orthodox worship. 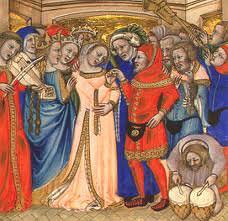 Scholars have struggled to understand alliances between Catholic and Orthodox marriages during the high middle ages. The distances also made little sense, from France to Russia – there was little use in having an ally so far away. Why? The answer Zajac posited was that rulers preferred to marry distant families rather than risk consanguinity by marrying the Rus families closer to home. The rules of consanguinity were calculated differently in Rus than in other areas, and followed different canonical regulations. She surveyed pertinent teachings on consanguinity and how it was applied in practice. Extant manuscripts are problematic because they are late – and used medieval genealogies. Consanguinity was counted by generations with the prohibition being extended to seven degrees (a possible Germanic influence). This posed serious practical difficulties in the choice of marriage partner, so if the prospectives mates shared one great-great-great-great-grandparent, they could not marry. Marriage was also not permitted if it was the lover or widow of a cousin in the sixth or seventh degree. The number of relatives you couldn’t marry also expanded as time wore on, including such prohibitions as preventing two cousins from marrying two sisters. In the 13th century, consanguinity was less of a problem so foreign marriages between Rus and their Catholic counterparts declined. Some marriages were still occurring that were considered illegal due to affinity according to western canon law. However, there were problems with many Latin sources because the relation of the bride wasn’t made clear. A document would say, “married a Rus girl”, this left out her name and filiation. Rus princes only broke consanguinity in distant cases, and there is only one case of a Rus prince marrying a first cousin. More distant intermarriages occurred with their Rus cousins (from Polish, Hungarian families) over several generations. In some cases, papal dispensation was sought to allow closer Polish-Rus intermarriages. While this might be a reason for marriage with Catholic noble families, compliance with church regulation on consanguinity doesn’t completely explain the need to marry a family so far away. In the end, Zajac suggested that here could be alternative reasons that need to be further examined.